Classroom teachers are just beginning to discover what art specialists have always known: storytelling and other expressive arts fire students’ imagination and generate innovative, creative thinking. When the arts are integrated across the curriculum, content becomes meaningful to children and they are motivated to learn. 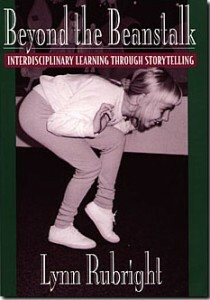 In Beyond the Beanstalk, storyteller and teacher Lynn Rubright demonstrates how K-6 teachers can use storytelling and the expressive arts not only as motivational tools to develop students’ skills, but also as ways to improve their own teaching styles. Lots of tried-and-true methods that teachers can put to immediate use are provided, including specific activities, stories to tell, drama games to enhance children’s creative responses, and much more. Teachers will gain confidence in their ability to tell stories and discover for themselves how stories effectively told can motivate and engage students. Click here to order Beyond the Beanstalk on Amazon.com.